The Broomhill Pool Trust is delighted to announce that Ipswich’s Grade II listed lido has received national recognition, with inclusion to Pastscape’s (English Heritage) database of National Monuments. “Lidos are a unique facet of England’s built heritage, epitomising a much-loved past time and a way of life. 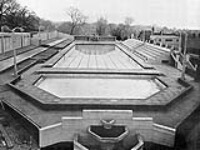 That’s why we have included the Grade II listed Broomhill Pool in the PastScape database (www.pastscape.org.uk ), a web resource with nearly 400,000 records of archaeological and architectural sites derived from the National Monuments Record, the public archive of English Heritage. Although this doesn’t confer any extra legal protection than it already has, it does mean that its special interest is highlighted and made available for anyone to study". "Ipswich Borough Council are currently carrying out a Culture and Leisure Needs Analysis, to identify current supply and demand for a range of facilities, and to help develop the Council's cultural strategy for the next 15 years. The Strategy will be formulated in February 2010. Meantime, IBC's Executive is due to decide the fate of the pool in late October. So, this is a welcome accolade, at a critically important time, for East Anglia's last Grade II listed lido. In our opinion, not only is a Broomhill Pool a nationally recognised building, it is an existing, low cost, solution to Ipswich’s acknowledged, swimming needs. Fully restored, it would deliver genuine community cohesion - and access to healthy pursuits - in a deserving area of Ipswich"